This program helps the user to enter five different values for five subjects. 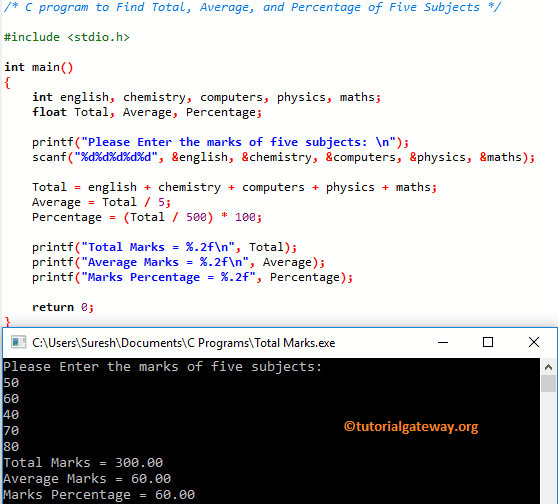 And then this c program find the Total, Average, and Percentage of those Five Subjects. For this, we are using the Arithmetic Operators to perform arithmetic operations. First printf statement will ask the user to enter the Total number of Subjects. For example, if the user enters 3 then, second printf statement will ask the user to enter those 3 values one after the other. For loop will resist the user, not to enter more than 3 values by using the condition i<n. In the next line, we are adding the user entered value to Total. Outside the loop, we calculated the average, and percentage.